Kelley Huston, a fixture at Cassel Hills Golf Course, retired on January 31. She will return in a part time capacity on April 1. VANDALIA — As winter turns to spring and business picks up at Cassel Hills Golf Course, long time patrons will notice a fixture at the course for most of the past 41 years isn’t around as much. 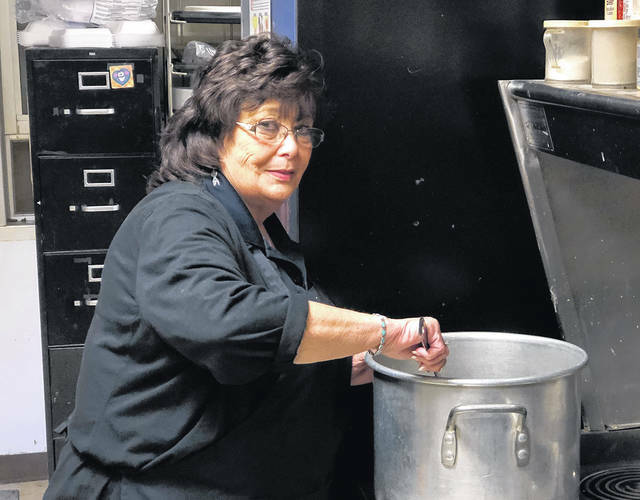 Kelley Huston, who has served or cooked at the course beginning in 1977 and, with one break, has been at the course ever since, is retiring. January 31 was Huston’s last day of full-time employment and, fittingly, was the day of the Rotary Club luncheon she has served for decades. There’s a silver lining, however. Huston’s “retirement” is only going to last the state-mandated 60 days. She plans to return to the course April 1 in a part-time capacity. Huston said she was thrown into cooking for large groups and learned as she went but leaned on lessons learned while watching her mom. One of those recipes is her barbecue ribs, a recipe she won’t share with anyone. For the most part, however, Huston says she cooks without recipes. For Huston, fulfillment comes from other people’s enjoyment. Huston said she hopes to spend more time camping with her husband.